Dust off your children’s pirate costumes from Halloween and come out for An Afternoon of Pirates on Saturday, July 21 from 1 to 4 p.m. at Saengerfest Park, 2302 Strand. YARRR sure to enjoy The Bilge Pumps, a pirate music group from Dallas known for their sea songs, sea shanties and Celtic music combined with a dose of comedy. Pirates from Pirates! Legends of the Gulf Coast will also entertain the crowd with periodic sword fights during the afternoon. The event is free and open to the public. During this free family event, visitors receive a $1 off on admission to Pirates! Legends of the Gulf Coast which is housed in the 1885 Butterowe Building, located off Saengerfest Park. For information on An Afternoon of Pirates, call (409) 762-6677 or visit www.PiratesGulfCoast.com. Pirates! Legends of the Gulf Coast is a pirate-themed family experience where visitors can learn about the legends, myths and stories of the last buccaneers. The interactive entertainment venue features the deck of a pirate ship, a captain’s cabin and actors who help to tell the story of the notorious Jean Laffite and his brother Pierre, as well as the life that all pirates led. Pirates is a tenant of Mitchell Historic Properties. 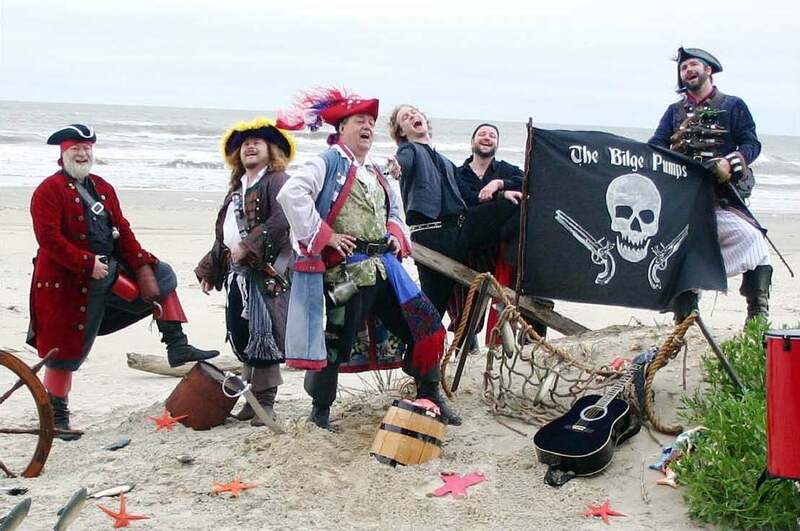 The Bilge Pumps, a pirate music group from Dallas known for their sea songs, sea shanties and Celtic music combined with a dose of comedy, will perform during an Afternoon with Pirates on Saturday, July 21 from 1 to 4 p.m. in historic downtown Galveston.